Ethan Young is the Eisner-nominated, Reuben Award-winning cartoonist behind Nanjing: The Burning City, a devastating look at one of World War II’s forgotten tragedies, as well as the creator of The Battles of Bridget Lee, an epic, inclusive sci-fi comic series for young adults—the second installment of which hits shelves next month. Before all of that, though, Young chronicled his life as a struggling cartoonist in the semi-autobiographical strip Tails, collected in its entirety this week from Dark Horse as Life Between Panels. In this hefty omnibus, Young depicts life at home with his parents, balancing his day job with his art and the creation of a character known as Crusader Cat, who soon comes to life as the barrier between reality and fiction begins to blur. As with many ongoing autobiographical strips, Young’s cartooning changes throughout the volume, but for Young, one aspect in particular grew: his portrayal of himself as a Chinese-American man. 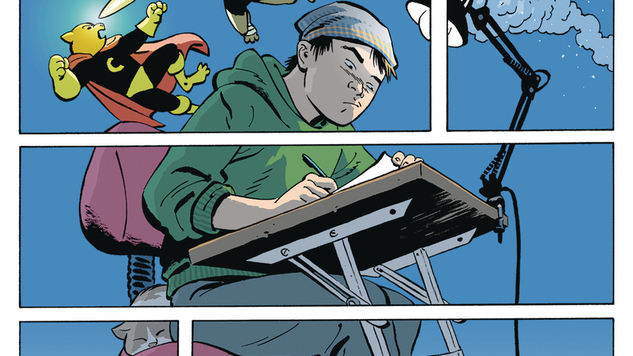 In honor of Life Between Panels’ release, Paste invited Young to contribute an original guest comic about his own self-erasure and reclamation of his Asian-American identity within his art. Be sure to pick up Life Between Panels this Wednesday for more on Young’s life and evolution as an artist.